Use the Winco CHH-104A Walnut Finish Stacking High-Chair to give families comfortable accommodations for their little ones. This seat has a 28� height that brings the child right up to table level while its 20� width allows it to fit easily at any table without making it too crowded. Featuring a wide seat, it can be used for children of different sizes and its sturdy strap keeps them comfortably restrained to prevent accidents. 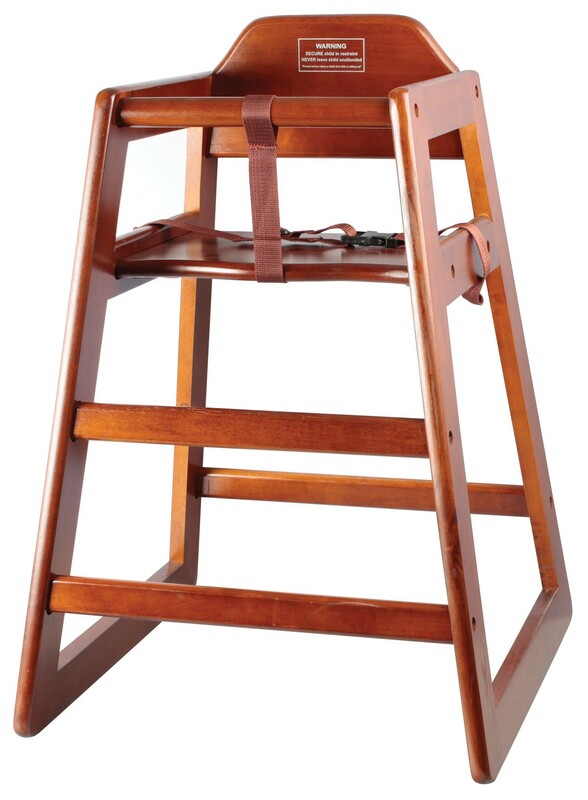 Constructed from durable rubber wood, this high chair can withstand heavy wear and tear and its smooth finish makes it stain-resistant. Boasting a sleek walnut color, it is attractive enough for any dining setting and also stacks easily to save valuable space. 20" x 20" x 28.75""